Organizations around the world are undergoing transformation fueled by cloud, artificial intelligence, mixed reality and the Internet of Things. These technologies are helping businesses and society reach new heights – retail is becoming more personal, banking is becoming more seamless, and healthcare is becoming more predictive and preventive. At the heart of these incredible stories of transformation – and more – are Microsoft partners. The Microsoft partner ecosystem is a group of hundreds of thousands of organizations driving positive, global impact. Building everything from line-of-business apps to industry-specific solutions on Dynamics 365 to gaming experiences, these companies are a natural extension of the team at Microsoft, delivering cutting-edge technology to millions of customers. Microsoft sees its partner’s success as its own and is squarely focused on delivering a true, two-way partnership with its partner network. In this year’s Inspire 2018, Microsoft announced new programs, tools and resources to help partners innovate, grow and differentiate their businesses. Whether they’re building apps or services, Microsoft partners need access to the latest technology from Microsoft and guidance on how to extend that technology to build tailor-made solutions. Microsoft recently announced exciting new innovations in Microsoft 365, including a free version of Teams, new intelligent events capabilities, the Workplace Analytics teamwork solution and more. The tech company also announced new cloud, apps and data technologies including Azure Data Box Disk, Azure Virtual WAN, Azure Firewall and more. Microsoft partners will be able to leverage these new offerings to help customers embrace and innovate in the modern workplace and continue to help customers in their journey to the cloud. In addition to new technologies, Microsoft released new Digital Transformation eBooks, and practice-building playbooks, expanding on the popular resources already leveraged by tens of thousands of partners looking to build and enhance their practices. In Microsoft’s third quarter, Azure revenue grew by 93 percent, with partners driving a considerable portion of that growth. 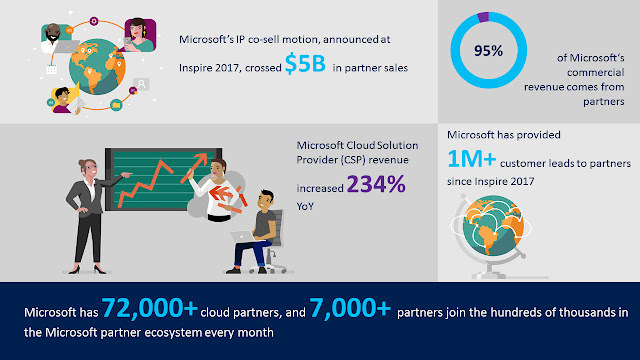 To build on this great momentum, Microsoft is doing two new things to fuel partner growth – leaning on its marketplaces and enhancing AppSource as the entry point for selling with Microsoft, as well as improving go-to-market benefits for partners to help them grow their businesses. The new marketplace capabilities include integrated partner-to-partner solutions, private offers, and expanded consulting services. Each of these new capabilities provides partners new ways to get solutions in front of a bigger base of customers and to provide them with a better buying experience. It is Microsoft’s focus to connect partners with customers. Microsoft is also providing greater flexibility and more opportunities to unlock new benefits that help partners go to market. Starting later this year, partners with competencies will have a choice of benefits packages based on their business focus. Microsoft is expanding core benefits to include access to services that support generating leads, improving lead velocity and increasing close rates for app or service offerings. For Microsoft partners, specialization is key to growth. Microsoft seeks to do more to help customers find the right partners with the right solutions. At Inspire 2018, the tech company announced new ways for partners to demonstrate their proven expertise to customers with the introduction of new advanced specializations and the new Microsoft Azure Expert MSP initiative. Partners can now demonstrate that they have the right capabilities to help with specific customer business challenges. At last year’s Inspire, Microsoft initiated a new journey with its partners, with a commitment to their success. In the world of Digital Transformation, everyone needs an ecosystem, and a partnership with Microsoft is a partnership with its ecosystem. Together, Microsoft and its partners are in a position to take advantage of the unprecedented $4.5 trillion opportunity and unleash the power of true partnership to unlock incredible growth and success – for each other, and for their customers.